It’s a mid-price battle. Is it worth trading up to a more expensive machine? 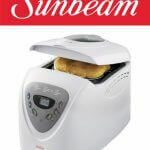 Bread machine prices range from $75 to $300. The standard assumption is that the more you pay the better the quality and set of features. If you’re shy about making a major investment and just not sure if it’s worth the premium price, here’s a comparison of two mid-priced machines that bundle generous features and benefits that could handle most baking tasks. 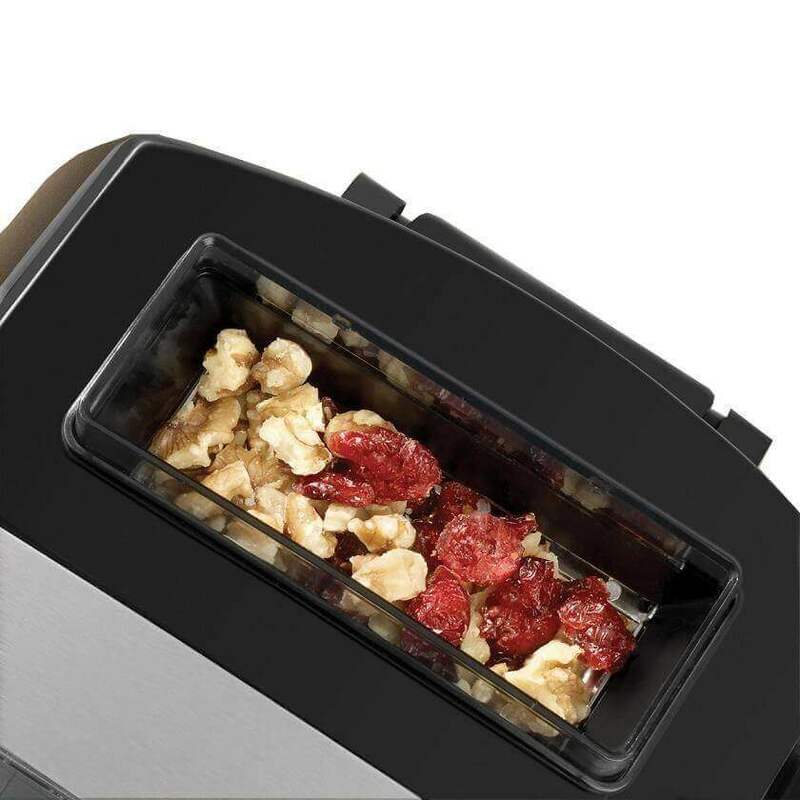 Both machines feature an automatic fruit and nut hopper. Most recipes that call for fruit or nuts require you to add the fruits or nuts midway through the early cycles rather than adding them to the bread pan at the beginning. The benefit of a fruit and nut hopper is that you don’t have to wait until after the first kneading cycle and an audible beep to know it’s time add fruit and/or nuts. Both machines do this automatically. A common lament from owners of machines with automatic fruit and nut hoppers is that the ingredients often stick in the hopper and never make it into the finished loaf. This is especially true for stickier fruits like raisins, craisins and dried fruit. An easy solution that many have discovered is to toss the fruit in a dusting of flour before adding it to the hopper. This will typically help the fruit to slip out of the hopper. Both machines have a generous number of settings including settings for gluten free and 100% whole wheat. The DeLonghi has a slight edge with 15 settings while the Breadman has 13 settings. Both machines have non-stick Teflon coatings although DeLonghi chooses to identify the coating as “diamond fluorine,” the trade-name for Teflon. I found this to be slightly deceptive. Some people are concerned about Teflon as a coating and calling it something else could mislead someone to buy something they don’t want. For the record, every bread machine we have reviewed has a Teflon coating but there are instances when the manufacturers have chosen to call it something else. Below is a chart offering quick comparisons of both machines. We’ll follow the chart with some key differences and our recommendation for the mid-priced champ. Both machines offer features with unique benefits that could appeal to you in different ways depending on what you bake and how you like to bake. While both machines have a viewing window in the lid, the DeLonghi has an internal light that you can activate to monitor your progress. Repeatedly lifting the lid can cause your loaf to fall or collapse especially in the later rising and baking cycles. The reason it’s important to track your progress is because the mixing and kneading cycles can reveal the need for the addition of a little more liquid or flour to get the proper dough consistency. You usually add a teaspoon of liquid or a teaspoon of flour at a time to get the consistency right. Once you’re got the dough to the correct texture you’re better off not lifting the lid. That’s where the internal light comes in handy. Both machines have standard settings for light, medium and dark crusts but the DeLonghi takes it up a notch with its top-browning element. Owners are generally pleased with this feature so if crust color and texture is critical to you, DeLonghi has a solution. However, most machines do a good job with crust color using the standard settings of light, medium or dark. The Breadman features some unique options when it comes to the breadpan. For one, it bakes a horizontal loaf. Some people prefer this loaf configuration because it’s similar in shape to loaves found at a bakery or grocery store. On the other hand, the DeLonghi features the traditional vertical loaf configuration. An interesting option with the Breadman is the ability to bake two 1-pound loaves at the same time. It does this with twin loaf pans in a vertical configuration nested side by side in the machine. This can allow you to experiment with slight variations in recipes or bake a loaf for a friend. The loaf sizes for the DeLonghi include 1-pound, 1.5 and 2-pound loaves. 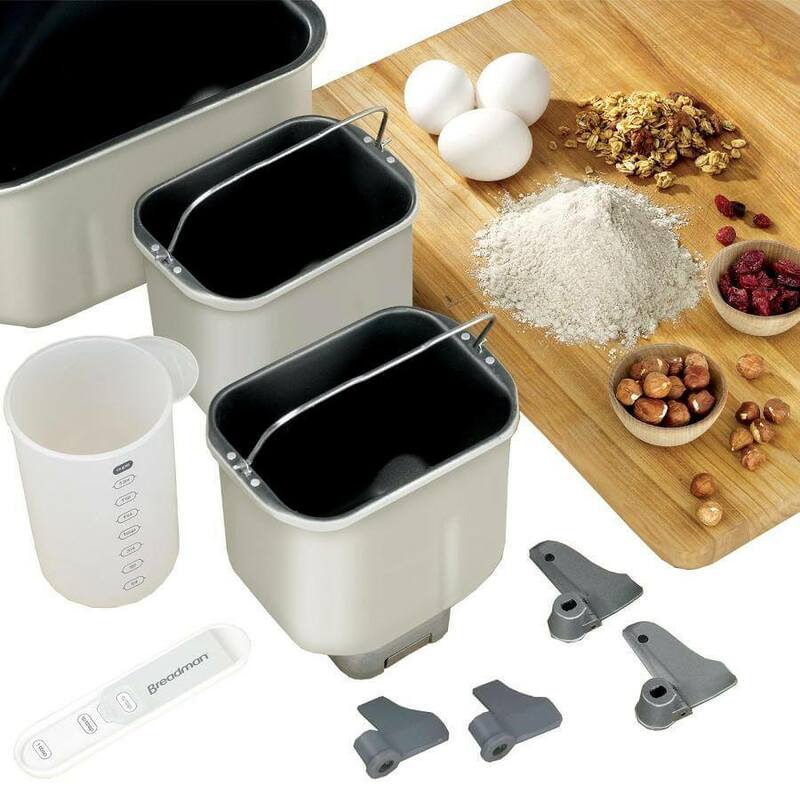 The Breadman features four sizes including 1, 1.5, 2-pound and a 2.5-pound size. The larger 2.5 pound loaf is common with machines that have a horizontal loaf configuration. Collapsible Paddles – Good New or Bad News? Both machines feature collapsible paddles. There are two collapsible paddles in the Breadman to accommodate the horizontal loaf size, and a single collapsible paddle in the DeLonghi. The promised benefit of a collapsible paddle is that it is designed to leave a smaller hole in the bottom of the baked loaf caused by the kneading paddle. The idea is that the paddle will unfold for kneading and retract or collapse when the kneading cycle is complete. A chronic pattern of complaints continually shows up with collapsible paddles. The paddles sometimes fail to collapse leaving an even larger hole in the base of a loaf, or fail to expand at all causing the kneading cycle to fail. The best solution is to make sure that a collapsible paddle is as clean as possible, and to test the paddle with your finger after it’s in the bread pan and before adding ingredients. The DeLonghi instruction book has a problem. All of the ingredients for any recipe are in dry and wet measures based on milliliters for wet measures and on dry weights in grams. We did an article to help our friends convert measures, but if you don’t have a scale or read our article it’s hard to figure out how to bake anything with the DeLonghi instruction book if you depend on standard measures like cups, teaspoons and tablespoons. There are also complaints about Delonghi’s communication about the 15 cycles on the machine. There is a small instruction book attached to the machine for these cycles, but many people have complained they when it’s lost you have no easy reference for the cycles. The Breadman has a significant problem. It not only provides a poor instruction book, but many of the recipes were blatantly incorrect including a report from one owner that the yeast in a 2-pound recipe was measured in cups rather than teaspoons! There also seem to be occasions where Breadman owners didn’t receive an instruction book, or were told to download it from the Internet. For what is essentially a well-engineered machine it’s mind boggling to think that something as basic as an instruction book could create such an issue for its owners. 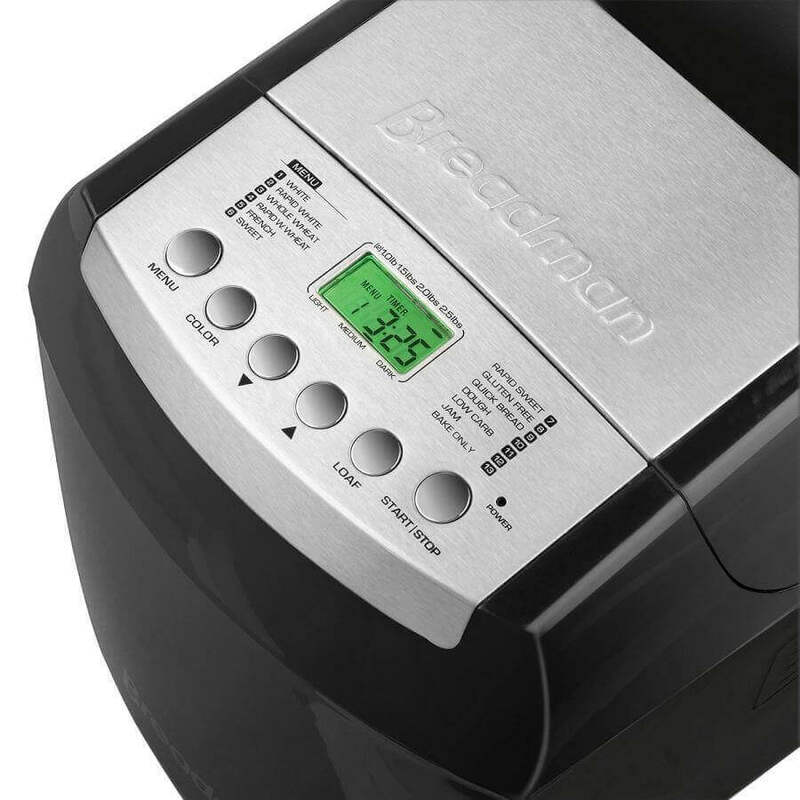 Owners also report weak and inconsistent support for the Breadman while DeLonghi got high marks for their support and service. 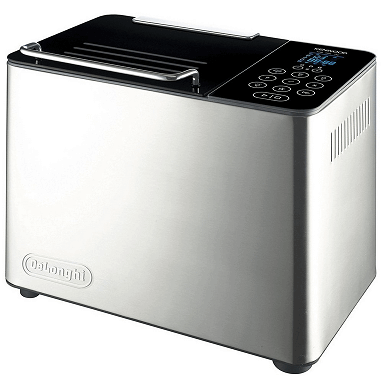 DeLonghi offers a 1-year limited warranty while the Breadman offers a 2-year limited warranty. And the Best Mid-Priced Bread Machine is…. The DeLonghi DBM450 has more advantages than the Breadman BK2000B and would make a good choice if you’re looking for a mid-priced bread machine. 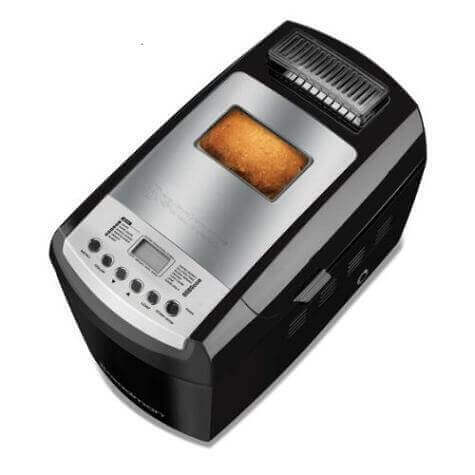 While the horizontal loaf configuration and two 1-pound loaf baking capability is in the Breadman’s favor, the lighted viewing window and top-browning element give the DeLonghi some valuable benefits. There’s also that instruction book problem with the Breadman, but if you review the recipes we’ve included on our website you’ll find good solutions across a wide range of recipes and ideas.